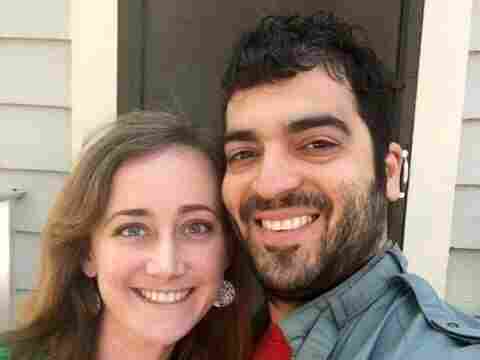 About a year ago, Gustavo Douaihi and Laura Smith were looking to rent a house in Baton Rouge, La. Douaihi, a geologist from Venezuela, and Smith, a high school English teacher who grew up in Alabama, had just gotten married. The couple was living in a tiny house overflowing with wedding presents when they noticed that a larger, nicer home in their neighborhood was available for rent. "When we saw the 'For Rent' sign, I pushed Gustavo to call and look into it," Smith says. Douaihi left a voicemail with his name, explaining that he was a young, married person already in the neighborhood and interested in moving to another home. He didn't hear back. He called again a week later. Again, no reply. Then Smith called and left a similar voicemail and left her "very white" name. This time, "the woman texted me back like within five minutes," Smith says. "It was so clear that the landlord responded differently to me than to my husband," she says. "The only different information she had between the two voicemails was ... a Hispanic name." Over the years, many other Latinos have had similar experiences. In a new poll, 31 percent of Latinos report that at some point in their lives they experienced discrimination because they are Latino when looking for a house or apartment. The poll was sponsored by NPR, the Robert Wood Johnson Foundation and the Harvard T.H. Chan School of Public Health. And housing discrimination has lasting, profound effects beyond the frustration Douaihi and Smith experienced. "A safe, decent, affordable apartment can act like a vaccine. It can keep you healthy now and in the future," says Dr. Megan Sandel, a pediatrician and researcher at Boston Medical Center. The safety, education norms and social networks of neighborhoods matter just as much as lead paint and leaky pipes. "That has huge implications for your income and ultimately your life expectancy," Sandel says. "Your ZIP code may be more important to your health than your genetic code." Her hospital is in Roxbury, a lower-income neighborhood in Boston with a large minority population. "Right outside of our door here at Boston Medical Center, the average life expectancy is 58 years," Sandel says. "You travel 3 miles down to the Back Bay, and the life expectancy is 91 years. We know that that is based on your environment." So if Latinos and other minority ethnic groups are being discriminated against and end up in neighborhoods with fewer resources because of it, it's discrimination with a real public health concern. Stephen Ross, an economist at the University of Connecticut, says there is evidence that housing discrimination against minorities is on the decline. "This happens much less than it used to," he says. In his research, white, black and Latino researchers, posing as people looking for a new home, show up to inquire about houses or apartments to rent or buy. In 2000, a study found that nearly 7 percent of the time, Latinos were told by landlords that apartments were not available to rent when in fact they were. Twelve years later, that happened only 2 percent of the time. Ross says that over the past three decades, enforcement efforts by fair housing centers across the country have made a real impact, but these efforts continue to find evidence of discrimination. Douaihi and Smith found a bigger house to accommodate their needs this past spring. But when their experience with discrimination comes up, it's still painful. "She hasn't stopped telling her family and friends about it," Douaihi says. "She's on my side, which is great."